Vivian Johnson coos in her crib and nods her head as her mother, Lisa Johnson, sings her “Happy Birthday.” She celebrated her first birthday in a small hospital room. Gigi Elliott, a child life specialist, stands on the other side of the crib, also singing and playing with Vivian. Child life specialists like Elliott work to help children cope with the challenges of being in a hospital, providing support for the child through play and learning. Betsy Rosebrugh, manager of the Child Life program at Phoenix Children’s Hospital, said health care professionals must take the developmental and psychosocial needs of pediatric patients into account – and that’s where the child life specialists come in. Nationally, there are 5,202 certified child life specialists who hold the credential, according to the Child Life Council, a nonprofit association. However, that does not mean they all work as child life specialists. Child life programs not only support patients, they also help their families. Vivian, born with heart complications, was diagnosed eight weeks ago with cardiac failure. Her two siblings, Savannah and Blake, also have called Phoenix Children’s Hospital home while their sister waits for a new heart. “(Vivian is) on high priority for a heart transplant, and she has to remain inpatient because of the severity of her heart and the (intravenous medication) that she needs to get her to a transplant,” Vivian’s mother said. Once the family found out about Vivian’s condition, even the most simple aspects of their lives changed. Vivian’s mother calls Elliott, the child life specialist on their floor, a life saver for helping the family get through this tough time. It is not just play, child life specialists help the children and their siblings understand the medical components as well. 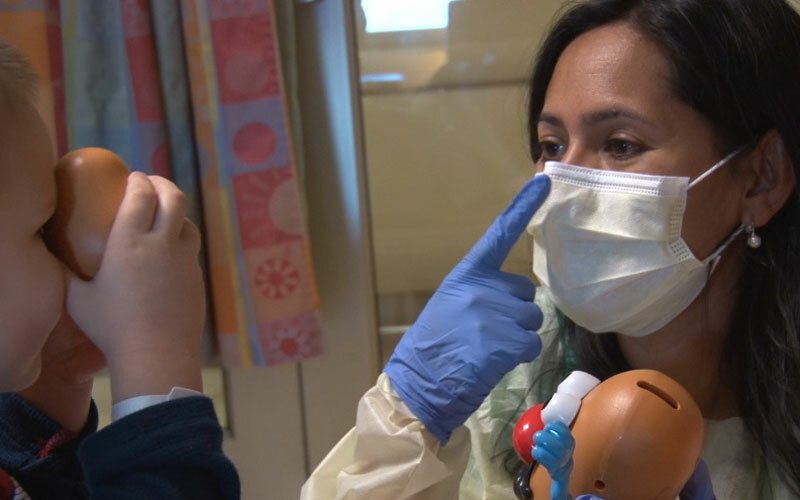 As she played with Nolan Nikolic-Dzaka, an asthma patient, child life specialist Eydie Fernandez said her favorite part about her job is helping the child forget they’re in a hospital. For Emilija Nikolic, Nolan’s mother, having a child in the hospital is not something she expected, but she appreciates the people trying to make the situation better. At the end of the day, child life specialists want children like Vivian and Nolan to go home healthy, knowing they’ll always have a friend at the hospital. For Lisa Johnson, Vivian’s mother, she hopes her children leave the hospital with something more.